There is a mainly Sepharadic custom to do Birkat Kohanim under the Chuppah, but I can't seem to find a concrete source for it. In Yalkut Yosef, Sova Semachot 8:5, Rav Yitzchak Yosef merely addresses why it's not an issue to say Birkat Kohanim outside of Chazarat HaShatz or orally, in general. He does not actually give a source for the Minhag, though. 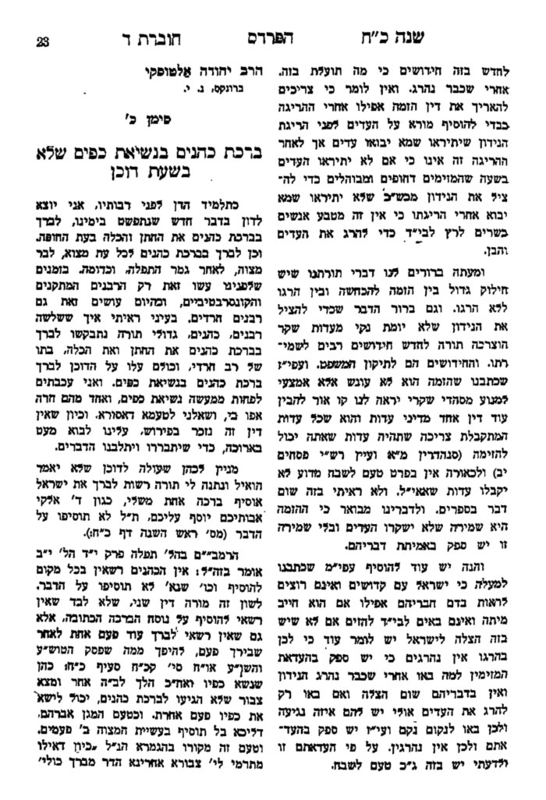 Nissuin Kehilchetam (12:67 footnote) points out that it's a strange Minhag that caused some strife between Rabbanim in America sixty years ago. 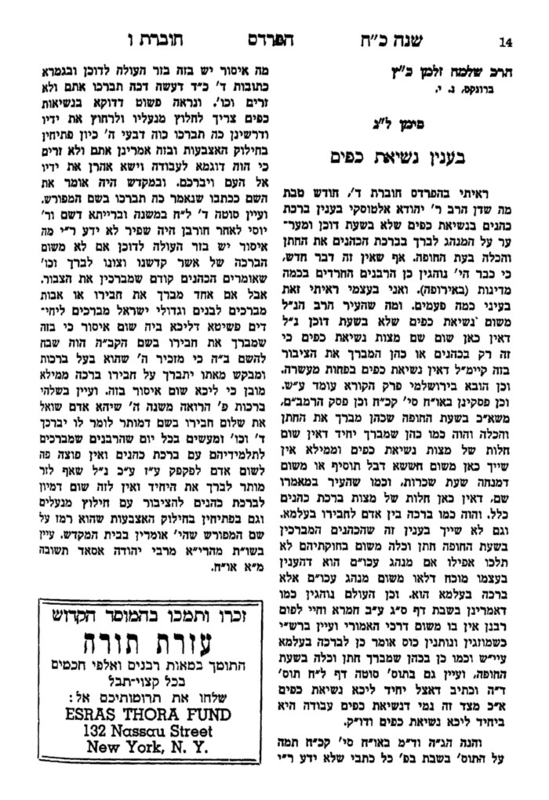 Specifically, Rav Altusky was very upset at a number of Gedolei Yisrael whom he saw do it, and Rav Shlomo Zalman Katz responded, as printed in HaPardes, vol. 28, Simanim 20 and 32. The Nissuin Kehilchetam also cites a Khina veKhisda vol. 1 page 138 amud 4, but it doesn't seem to be relevant (it's about Shehasimcha bimono). I've included parts of the findings below, but it's not at all satisfying. Could someone point me towards a source? Turns out it's on the previous page in this edition of China veChisda, but the explanation is very minute. Sixty letters being equal to the gematria of the word הכלה in the end of the last Beracha. Not the answer you're looking for? Browse other questions tagged minhag wedding birchas-kohanim . Birkat Kohanim in Mussaf on Simchas Torah? What is the source for untying things before going under the chuppah? In birkat kohanim, who calls out “kohanim”?